With celebrity breakups being prominent over the past couple of years, it’s refreshing to see couples who are so in love, they can’t stop talking about each other. First it was Tom and Giovanna Fletcher (that wedding speech, sigh), then came Chrissy Teigen and John Legend (couple goals), and now Kit Harington and Rose Leslie are kicking off 2019 in the most adorable way possible. Because Kit – aka Jon Snow in the mega-successful fantasy series Game of Thrones – is already looking to the future, after tying the knot with co-star Rose last summer. In an interview with GQ Australia, the actor revealed he looked on Game of Thrones as an amazing way for the couple’s potential future children to see how their parents met. It dawned on me, recently. And I have no idea if we will, but say me and Rose do have children. They’ll know. They’ll be able to see the genesis of their parents getting together. Which is quite a wonderful thought, really. I’m too emotional for this. He then went on to talk fondly about his wife, musing how he wouldn’t have met her if it wasn’t for the show. I thank the show for everything. But more than anything else, I thank it for introducing me to her. The couple married in June at Rose’s childhood home, Wardhill Castle, where 80 members of their closest family and friends – including co-stars Emilia Clarke and Peter Dinklage – gathered for the celebration. Rose and Kit met in 2011 while working on the second season of Game of Thrones – they played enemies-turned-lovers, Jon Snow and Ygritte, and they’re believed to have started dating soon after. There were rumours the pair had separated, but they proved false when the couple got engaged in September 2017. Kit’s known for ages he’s wanted to marry Rose but he wanted them to get a house and settle down a bit first. After moving in together in January he felt it was the right time to take the next step. It wasn’t all smooth sailing though, as Kit recently revealed his and Rose’s wedding day coincided with one of the last days of shooting on the eighth and final season of Games of Thrones. In order to get his friends the time off work to attend, he had to call the producers and ask them if they minded shutting down filming for a day. Not awkward at all. I rang up [the producer] and I said, ‘I’m getting married and it’s your fault actually’… I think for the final season he is so stressed that he’s reached that peaceful level. I was like, ‘You need to factor in a Game of Thrones wedding by the way.’ They have all got to be there so the whole thing has got to shut down. Luckily, the producer said yes – who in their right mind would miss that wedding?! Now, if you’ll just excuse me while my emotional self goes and re-watches the entirety of Game of Thrones. 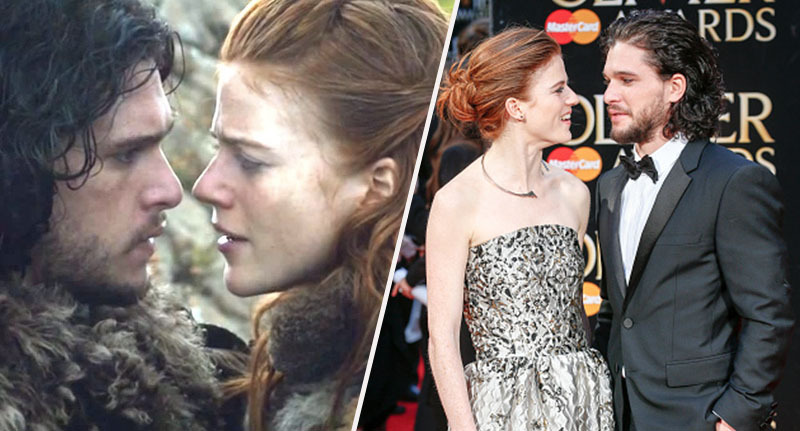 GAME OF LOVE When was Kit Harington and Rose Leslie’s wedding, where did they get married and when did the Game of Thrones actors get engaged?